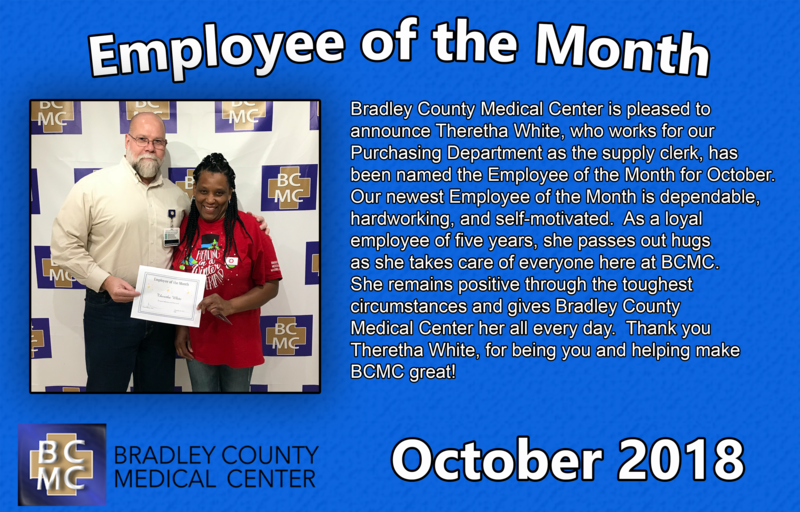 Bradley County Medical Center is pleased to launch a new "Employee of the Month" program in order to recognize team members that exemplify the commitment to patient care that BCMC strives to achieve. These employees emulate our mission: to provide superior care to every patient every time. We hope you all will help us recognize and celebrate the successes of our employees. B = BEING AVAILABLE TO OUR PATIENTS. The nominee should go above and beyond normal daily tasks in order to provide for our patients. C = CARE THEY CAN DEPEND ON. The nominee must be reliable. Their attendance, willingness to help, and attention to detail are above standard. M = MAKING A POSITIVE IMPACT ON HEALTHCARE. What has the nominee done that positively impacts the BCMC image (community outreach, volunteering for projects, special certifications, role model in employee wellness program)? C= CONSTANTLY PROVIDING THE HIGHEST QUALITY OF CARE. The nominee should constantly provide quality service, that exceeds our expectations. Nomination Forms may be picked up outside of the HR office or DOWNLOADED HERE. Forms should be submitted by the last Monday of the month. CLICK HERE to view the Employee of the Month for October 2018. 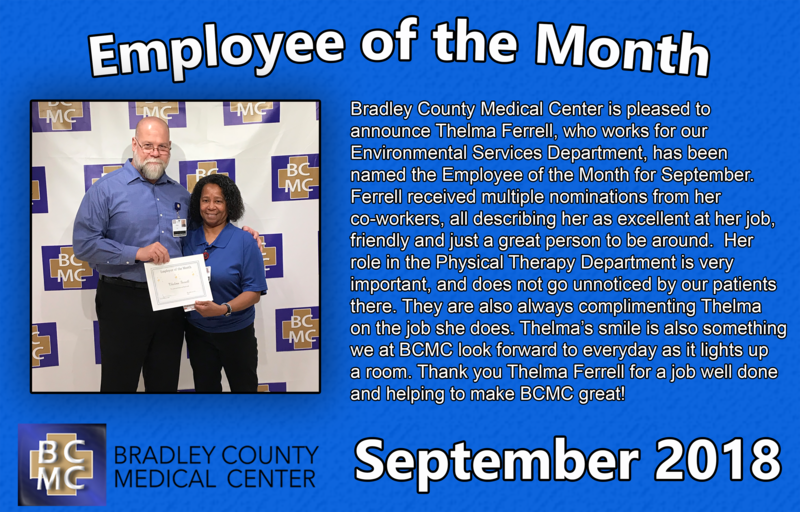 CLICK HERE to view the Employee of the Month for September 2018. CLICK HERE to view the Employee of the Month for August 2018. CLICK HERE to view the Employee of the Month for July 2018. CLICK HERE to view the Employee of the Month for June 2018. CLICK HERE to view the Employee of the Month for May 2018. CLICK HERE to view the Employee of the Month for April 2018. CLICK HERE to view the Employee of the Month for March 2018. CLICK HERE to view the Employee of the Month for February 2018. CLICK HERE to view the Employee of the Month for January 2018. CLICK HERE to view the Employee of the Month for December 2017. CLICK HERE to view the Employee of the Month for November 2017. CLICK HERE to view the Employee of the Month for October 2017.